Book Release: The American Muslim Agenda will be released by Thanksgiving. As a community, American Muslims have not developed any concrete plans to extricate themselves out of the chaotic situations, hostility and incessant Islamophobic rhetoric they face. Each time a terrorist acts out, we start praying and wishing that the terrorist not be a Muslim, and start making piss poor excuses or blame the media for mis-representing Muslims. We are Americans, and we can do better than that. We have been misled by the right-wing Muslim scholars of the past, they have distorted the pluralistic teachings of the Prophet and presented Islam as a political entity. Islam is not about governance; it is about spiritual and social guidance to live in harmony with oneself and fellow humans. The book is a primer to a Blueprint for Muslims to consider, let the discussions begin followed by a concrete plan of action. A Muslim is someone who is a conflict mitigator and a goodwill nurturer, a formula for peaceful societies practiced by Prophet Muhammad (PBUH) with guidance from the Quran. This book paves the way to own up the mistakes we have made, and continue to make them. We have to fix them for our next generation to live a fully integrated life with fellow Americans with least conflicts. There is only one America, and all of us are an active part of it. We need to learn to engage with those who are opposed to us, and I have success stories to share. We have to be a part of the American story and become one with all to build a secure future for every American. All humans, men, and women are created equal, and no one is more privileged than the other. We need to reassure each other, particularly the disconnected ones, that together as Americans, we are committed to safeguarding the American way of life. No American needs to worry about losing his or her way of life. Together as Americans, we uphold, protect, defend and celebrate the values enshrined in our Constitution; a guarantor of the way of life for every American. Two of the Nineteen chapters focus on Islamic Values and American Muslim Agenda. 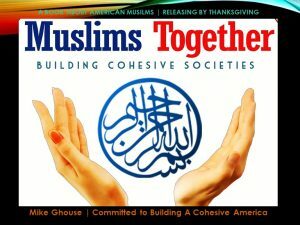 Islamic values that contribute to building a cohesive America where each one of us can live in peace with the other. Whereas, the American Muslim Agenda recommends items for Muslims to consider in becoming full-fledged contributing Americans to America’s success story. When we start defending America and American values and quit bashing America, we are in! We become an integral part of the American Story. Radical Muslims on the March | Mike Ghouse and Bridgett Gabriel Contested Debate on Fox NewsAnti-Islam activist Bridgett Gabriel got into a heated debate with Muslim commentator and interfaith activist Mike Ghouse on a Fox News segment with Host Sean Hannity. The panel also had one of the most prominent anti-Islam activist Pamela Geller on board. I am grateful to many friends, whose names will be listed in the book for their support.